A predictive science or divination has inherent limitations including the astrologers expertise and customer co-operation. Nadi Shastra is also called Nadi Astrology because it is closely related to Rashi or Sun/Moon/Star Signs. The Nadis in the human body refers to subtle channels for energy flow. At the cosmic level, There are hundreds of Nadis associated with the heavenly or celestial objects in conjunction with the Zodiac. 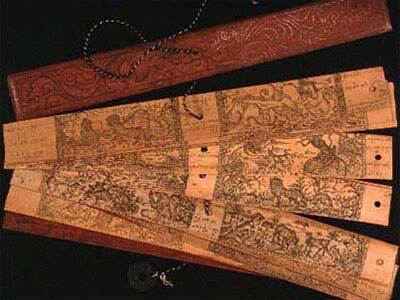 There are Naadi texts or leafs with inscriptions which provide the necessary information for making predictions on various matters of personal and social interest. At our centre, Only authentic readers are employed for reading and making predictions as per rules of Naadi Astrology Mumbai residents can rely on our services for accurate, trustworthy, and long lasting predictions. Researchers and spiritualists have investigated and rediscovered authentic Naadi or palm leaf inscriptions with reliable predictive text. A disciplined and dedicated reader with spiritual mindset can correctly read, analyze, and interpret these inscriptions to solve the customer's problems related to children, family, marriage, accidents, jobs, health, and many more vexing and troubling issues. At our centre, We provide only skilled services to help you resolve your personal and professional problems with the help of predictions made using naadi shastra. In Mumbai, Customers can rely 100% on our intuitive and spiritually inclined palm leaf readers for good solutions to their domestic challenges and commercial problems. Although Tamil Nadu is considered the birthplace of Naadi Shastra related predictive science and art, There are many places in India with authentic and verifiable palm leaf inscriptions. A combination of spiritual knowledge, reverence for Gurus, Faith in inscriptions, calculations related to zodiac and energy flow in human body, etc., are utilized in making the necessary predictions. Our services pertaining to naadi astrology in Mumbai are characterised by theoretical understanding, reliable research, and astrology masters. Activities, happenings, events, and possibilities pertaining to past, present, future, and immediate future are predicted in a satisfactory manner by our courteous and professional astrologers with insight and expertise. The world has many mysteries including the timeless wonder of rewriting our own destinies with the help of spiritual knowledge from the past. A person who has a good understanding of what is good for him or her does not get stuck or stagnant in any aspect of life. Whether it is health, wealth, career, business, or relationships, positive rebuilding requires moral and spiritual support. Our naadi jyotish in Mumbai has the required expertise and experience to help you overcome difficulties and hardships so that your entire family benefits. In addition, The customer has the option of asking more questions to find authentic solutions for avoiding future obstacles and troubles. There are some customers who are reticent, shy, and not very communicative. In addition, they also have problems related to social behaviour and articulation of their thoughts. Our predictive services pertaining to naadi astrology in Mumbai are geared towards helping such customers. The palm leaf readers and reading sessions have an identification and solution seeking aspect that helps in finding workable solutions to the satisfaction of the customers who are withdrawn or silent. The palm leaf reading and predictions have mythical, mysterious, and mystical aspects. Our services are however characterized by continuity, faith, and intuition of nadi shastra . Mumbai customers who are curious can seek additional information on Naadi Jyotish by calling our friendly representative on the phone or using email service today.